Chromebooks become much more powerful with full access to Google Play. 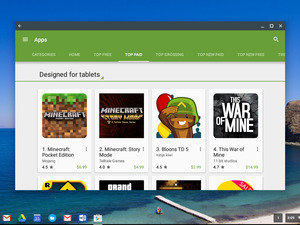 Android apps on Chrome OS are here today if you have an Asus Chromebook Flip. Switch your Chromebook Flip to Chrome’s Dev channel and you’ll get full access to the entire Google Play Store on your device. Android apps will arrive on other eligible Chromebooks in the future. Once you put your Asus Chromebook Flip onto the Dev channel and update it, you’ll get a Google Play Store icon on your taskbar. Click or tap the icon and the Play Store—itself an Android app—will open in a window on your Chromebook’s desktop. You can browse the store and install apps, just like you would on an Android device. 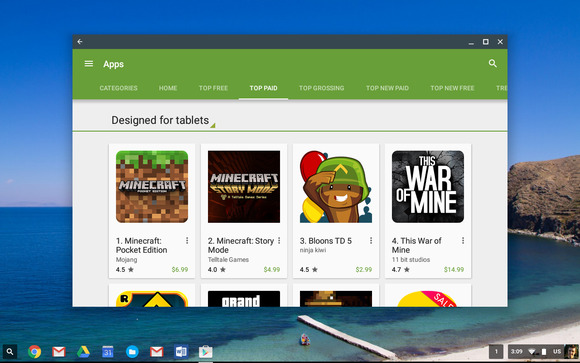 The Play Store treats your Chromebook as an Android 6 tablet, so you’ll get the tablet interface in these apps. Apps you install appear in your app launcher and on your taskbar as applications in their own windows. They’re not restricted to some weird separate interface, as Microsoft’s Metro apps were on Windows 8. How well does it work? Almost perfectly. If you ever played with Google’s previous solution for running Android apps on a Chromebook—known as the Android Runtime for Chrome, or ARC—you’ll be shocked at how well it works. Where ARC limited you to a few hand-picked apps that had to be modified and installed from the Chrome Web Store, Google’s new Android support gives you unfettered access to the Google Play Store and lets you go crazy. That’s because Google is actually running a full, actual Android system in a container alongside Chrome OS. It’s not emulation—it’s Android. This new Android support isn’t without its issues. Some apps don’t yet work, or have bugs—but every app I’ve tried works perfectly. Currently, you can only run apps in full-screen mode or in a window of a fixed size—it would be nice to resize them. Notifications can be a little unreliable, and apps can crash or freeze when you change your device’s orientation. But this is the first release, and these are bugs that can be fixed. Yes, this feature needs some more polish, but the core is unbelievably solid. Mouse and keyboard support works pretty well. Right-clicking performs a long-press, so it brings up contextual actions. As a Chrome OS engineer noted on Reddit, scrolling just moves a “virtual finger” on your screen, which means you can swipe on your touchpad with two fingers to swipe around in apps. The touchscreen works very nicely for these apps, too. Microsoft’s Office apps for Android bring offline Word, Excel, and PowerPoint functionality to Chromebooks. Android apps catapult Chrome OS beyond being “just the web” and open up Chromebooks to far more functionality. While Microsoft is still desperately trying to build out the Windows Store and its Universal Windows Platform, Google just gave Chrome OS access to one of the biggest mobile-app universes. This is huge news for Chrome OS. So many limits have now been blown past. For example, Chromebooks now have access to a full Skype application that supports video and phone calls, unlike Skype for Web. 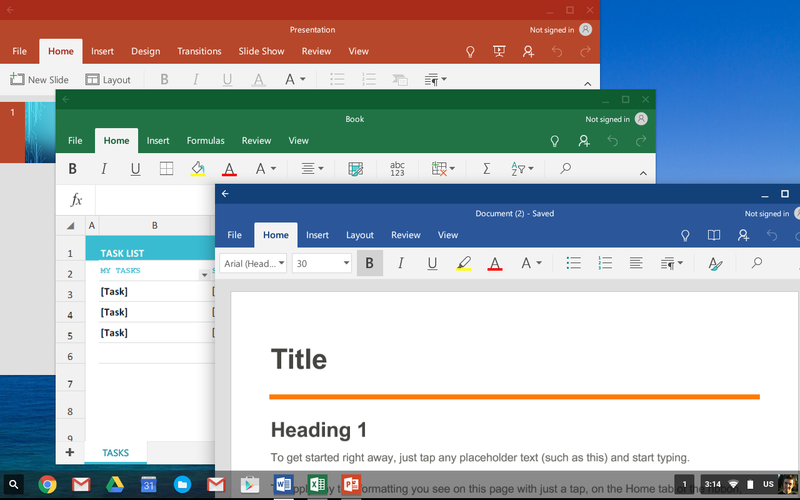 Chromebooks can now use Microsoft’s Office applications entirely offline, something Microsoft’s Office Online has never allowed. Chromebooks gain access to a large number of games that have never bothered with a web-based complement, such as Minecraft and Blizzard’s Hearthstone. Indeed, any services and games that have poor web apps—or no web apps at all—offer Android apps that can now fill the gap. Chrome OS now has a larger software ecosystem and will be a stronger competitor to Windows in the future.